After launching its first model in 2013, Fairphone has worked with Seymourpowell to create a new phone that aims to be long-lasting, sustainable and use conflict-free materials. 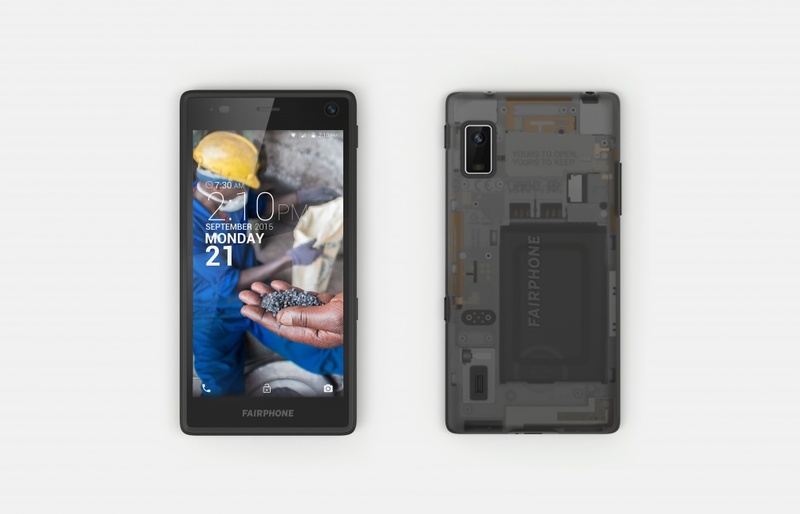 Dutch company Fairphone has unveiled its Fairphone 2 model – a smartphone that aims to be long-lasting, sustainable, easy to repair and which uses conflict-free materials and aims to give transparency to the supply process. The original Fairphone was released in 2013 and used tin from conflict-free mines in the South Kivu province of the Democratic Republic of Congo and tantalum from separate conflict-free mines in the DRC’s Katanga province. It was designed to be adaptable for each user, with dual SIM, removable batteries and the option to use any operating system. Fairphone was launched through crowdfunding and went on to sell 60,000 units. The new Fairphone 2 was designed with Seymourpowell, who advised on the original Fairphone development. The new Fairphone model has been designed to have a longer lifespan than other phones. Hebert says: “The first item we wanted to address is immediately visible”. He says most modern smartphones are “inherently fragile”, which is why many users add a cover. With the Fairphone 2 design, the replaceable outer shell also acts as a protective case. Hebert says this allowed the designers to replace the battery door, which becomes redundant, and add features such as a rubber rim that wraps around the glass. The team also specified a “drop requirement” – that the phone should be able to withstand being dropped from 1.85m (the average height of a Dutch man) on to a concrete surface. Hebert says this is a more rigorous test than most modern smartphones face. Although Hebert says the thickness constraint was “relaxed” for the design team, the phone still comes in at 11mm wide, while Hebert says the height and weight are similar to other smartphones currently on the market. Moving to the phone’s inner workings, Hebert says the team wanted to “reinvent the phone’s architecture to make it easier to assemble and service.” The ultimate aim is that people who buy the phone will be able to repair and replace certain elements themselves. The modular approach to the Fairphone 2 is similar to the approach used in Google’s planned modular phone, developed by Gadi Amit and New Deal Design. For the Fairphone 2 there are a number of replaceable elements, including the external case, the battery pack and the camera and speaker units. Hebert says that the aim has been on making repairs as easy as possible for the user. He says that if the display case is cracked it can be replaced in less than a minute, without the need for any tools. To further ease repairs, each replaceable unit is connected to the phone’s chassis with a set of colour-coded screws. An expansion port is built in to the back of the receiver which Hebert says allows for future upgrades with features such as NFC payments. The Fairphone 2 uses the Qualcomm Snapdragon 801 platform and Hebert says the phone was “designed from the inside out”, meaning that engineering and mechanical design were developed a the same time as the product design. The team worked with technology consultancy Hu-Do to manage this design process. 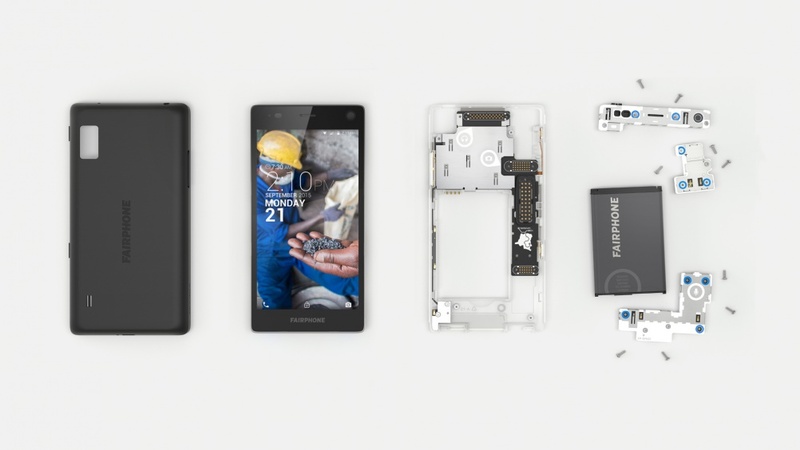 Like the first model, Fairphone 2 aims to use responsibly-mined minerals and the Fairphone team says it has a focus on the Democratic Republic of Congo, where it aims to buy from local and small-scale initiatives. Fairphone 2 is set to go on pre-order in the summer and is priced at 525 euros (£375). All images courtesy of Fairphone.